Previously, on MinerBumping... Rebel leader liberty's alliance got nuked by its only other remaining member, Syrax Vanity. liberty immediately pointed the finger at me and Agent Bing Bangboom. Where others see problems, I see opportunity. When someone accuses me of doing something I didn't do, I make a point of not merely denying the accusation, but also instructing the accuser to follow the Code. This reminds them that regardless of their suspicions about me, they're ultimately the guilty party. I recently learned that your alliance has been betrayed and that everything you've worked for over the last ten years has been destroyed. I assure you that I had nothing to do with Syrax's decision. I am writing this letter to let you know that you will always have a place in the New Order family. I would love to see you killing some miners, or bumping them out of range, or taking other revolutionary actions against the carebears. All I ask is that you renounce evil and pledge your loyalty to the New Order and its Code. Given your experience as a rebel leader, I'm sure you could help other rebels see the futility of their resistance. In times like these, it may be tempting to put blame on others. In the end, however, it was not the fault of Syrax or even Bing Bangboom that your alliance failed. It was doomed to failure from the start. Building a highsec alliance upon a foundation of bot-aspirancy is like building a sandcastle too close to the ocean. In time, it is bound to wash away. Whatever endeavors you decide to pursue, I wish you the best of luck--provided said endeavors are consistent with the Code. Durandi was speaking liberty's language. He got a reply out of liberty and forwarded it to me. well it will be going fine though wish they would tell truth it wasnt new order that crushed us at all was a traitor in mix Syrax Vanity stole value of 200bil in value in bpo's ships materials and much more. We are just gonner rebuild, usato is recreated once again and the process of rebuilding what assets that took over 10 years too do is being rebuilt. what peed off most about though even though painfull wasnt the assets stollen but that Syrax Vanity booted the other corps and closed the alliance making it so that usato surrendord in James 315's eyes and others that they had won and the new order has deafeted usato. well this is gravly mistaken and we will be coming back at the new order stronger than before all this has done has given us a time with out wardecs on our backs too rebuild and grow once again. This being the only real thing hated as would rather quit eve than surrendor too the new order. Some question how the New Order can show the compassion it does. By all accounts, liberty is a bot-aspirant. Yet we show her compassion. Why? For starters, think about the toll mining in highsec for 10 years takes on a person. Even someone who strives to obey the Code in all things would end up more machine than man after 10 grueling years of highsec mining. Or you could go with a "Gollum" analogy, if you prefer. That's where our Agents come in. They never give up trying to save the carebears--even bot-aspirants in as wretched a state as liberty's. Bing Bangboom > Miners of Kino! By choosing to mine in this New Order system you have agreed to follow the New Halaima Code of Conduct. 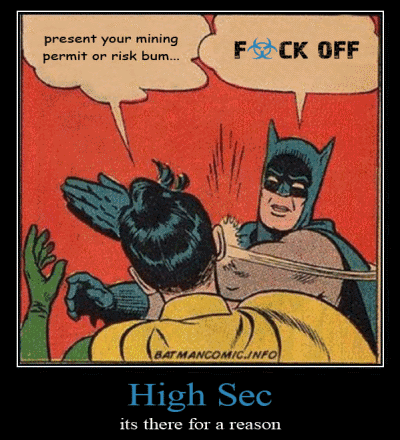 Bing Bangboom > Each miner must have a one year mining permit, available from any Agent of the New Order for 10,000,000 ISK. 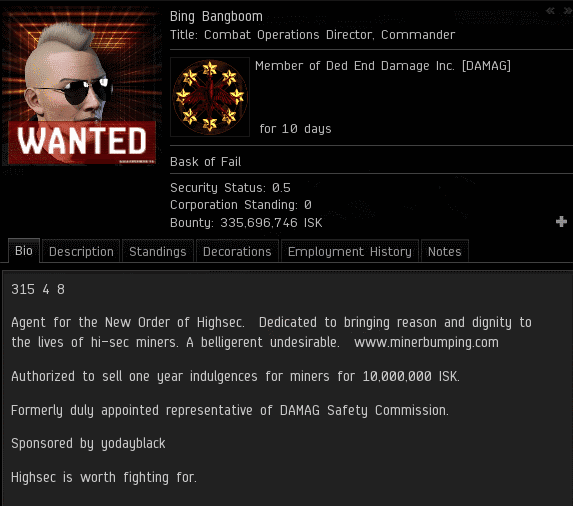 Bing Bangboom > Any miner without a permit is subject to bumping or ganking. After learning of the demise of liberty's alliance, Bing did what he does best: Working to save Kino. liberty's alliance might have died, but its legacy of bot-aspirancy remained. Kino had come a long way, but still had a long way to go. Bing Bangboom > The Code is for the good of the highsec miners. Bing Bangboom > Without it they become trapped in unhealthy behavior, like AFK mining or botting or filing petitions against me. Bing Bangboom > it leads to the idea that one can take an expensive mining ship, park it next to an asteroid, start the lasers and then go do the laundry. Bing Bangboom > The New Order exists to show players that this is unwise. Bing looked upon the carebears and saw their great need for the Code. Without the New Order, EVE would be nothing but a bunch of "busy" people doing laundry. Bing Bangboom > you know rule #1 of Eve, correct? Bing Bangboom > It's "don't undock in something you can't afford to lose." Bing Bangboom > Miners who afk mine are ignoring this rule. Suddenly, she spoke! liberty hadn't quit EVE after all. Bing was thrilled by the prospect of another opportunity to rescue the damsel from herself. And yes, liberty was still enamored of the dusty old anti-Order meme. She links it in her bio and corp/alliance descriptions. The rebels don't have much art to choose from, since art requires creativity--a distinctly human quality. Bing Bangboom > Did you read my email, lib? Bing Bangboom > I told you why it happened. liberty wasn't prepared to surrender to the New Order--at least, not on this day. She was fired up and full of paranoia. Like all bot-aspirants, she viewed EVE entirely through the prism of money. She assumed Syrax's betrayal must have been caused by a transfer of isk. Bing Bangboom > Has Syrax given you any explanation? Bing Bangboom > I'd say its more ironic than strange. The last 10 years have just been the warm-up. Now liberty meant business! Tylonal > I'm all for supporting trooops. but even the troops have to abide to the code. Tylonal > Where at Bing? Bing Bangboom > liberty and I are like Ali and Frazier, Achilles and Hector, Larry and Curley. Bing Bangboom > 30 pieces of silver. With nothing left to lose, liberty was resolved to have it out with her nemesis, once and for all. No punches would be pulled. Nothing would be left unsaid. Kino local was about to get real. That poster is missing an apostrophe. I imagine the new alliance will have some director vacancies that need filling. I have some spare alts. As long as Liberty is willing to embrace the Code, I will help her rebuild. 10 years to amass all that imaginary space money, and now he wants to do it all over again? Jesus wept. "The rebels don't have much art to choose from, since art requires creativity--a distinctly human quality." I see what you did there Bing. Good stuff. This promises so much for Part 3. Alas, I fear Liberty will fail to deliver. Kino local was about to get real. wait, local? No explosions? Booo. Lost it at this. B-e-a-utiful! that pic that was linked is stupid and does not even make sense. What reason carebears? "...does not even make sense." I'm guessing you weren't purposefully trying to be ironic. He's right though. That meme doesn't make any sense. I too, would like to know what reason liberty thinks exists that should prevent the existence of a mining permit. lol, I like it Shooty. Replying to the whole "make sense" thing with a terribly constructed sentence that goes on some nonsensical meandering path. You guys and your sense of humor... Keep it up! What are you talking about? We're asking what reason liberty's thinking of whenever he's posting that meme. Liberty replies to Durandi Ghostals evemail telling him it wasn't The New Order that crushed her alliance but merely a lone traitor from within. Later she goes to Kino and accuses Bing and by extention The New Order of bribing said traitor to disband USATO and liberating its assets. So which one is it Liberty? Was it the NO's doing or was it not?